Update: The contest is closed and I have emailed the winner. Thank you for following and playing along all week, as we've been giving away some lovely gifts to selected Theme Park Insider readers. To wrap up the week of giveaways, we are awarding some special Gringotts Bank souvenirs from the Universal Orlando Resort, plus a signed copy of our new guidebook, Theme Park Insider Visits The Wizarding World of Harry Potter. The prize pack includes a couple of souvenirs sent to the media in advance of the opening of The Wizarding World of Harry Potter — Diagon Alley, including a vault key and a "gold" bar. 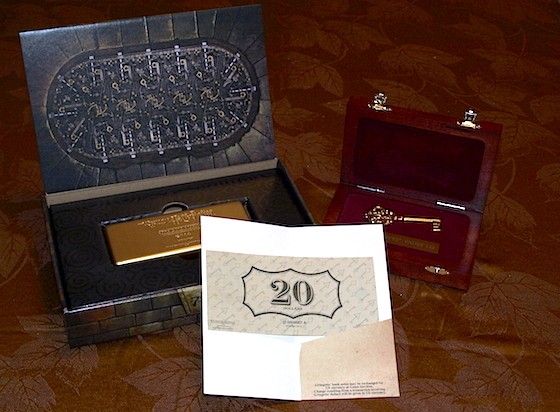 We're throwing in a $20 Gringotts Bank Note, as well, which can be spent anywhere in the Universal Orlando Resort. I will pick the winner by selecting one eligible entry at random at the deadline. (I will contact the winner via your email address in your registration profile. If the winner does not respond to me within 48 hours, I will disqualify that winner and pick another one, until I get someone who does respond.) Once we have a winner, I will post that to this page. The deadline for this giveaway is Tuesday at noon PT. Good luck! Every time I take a "test," the Sorting Hat puts me in Ravenclaw. Pottermore said I was in Hufflepuff. I can be a badger. Thanks again for the giveaways, and our Hogwarts house its Gryffindor! I hate to be cliche but Gryffindor would be my House. I'm not cunning, nor have the superior IQ, but I definitely feel like I can be courageous and a team player of the need be. I couldn't believe it but I'm a true Gryffindor. The sorting hat puts me in Gryffindor as well. According to Pottermore I'm a Ravenclaw. Gryffindor! Thanks for the giveaways! The Sorting Hat at Warner Brothers Studios in LA sent me to Gryffindor. Gryffindor! Thanks for the contest. GREAT site! Thank you for the great contests Robert! Gryffindor! Ravenclaw!!! This would be so awesome to win! According to the Sorting Hat app, I am Hufflepuff. These contests have been so much fun! Thank you for doing this! I took the Warner Brothers Studio tour in Los Angeles, and the sorting hat sent me to Gryffindor. I'm a Gryffindor, but secretly Slytherin like Harry Potter. I speak Parseltongue too. I need to be properly sorted, but I think I'm a Ravenclaw. Gryffindor is the only answer! Slytherin for all those cunning folks. Hufflepuff is what I got on Pottermore!!!!! Pottermore wants me to be Gryffindor, but I slipped the sorting hat a flask and he agreed to change me to Slytherin! I would be Gryffindor all the way! Do believe I'd be in Ravenclaw. OK. The contest is closed, and I have emailed the winner. Thank you to everyone for entering!